Botswana is a landlocked, semi-arid country of 582,000 square kilometres, about the same size as Kenya and France. It shares borders with Zimbabwe, South Africa, Namibia and Zambia. 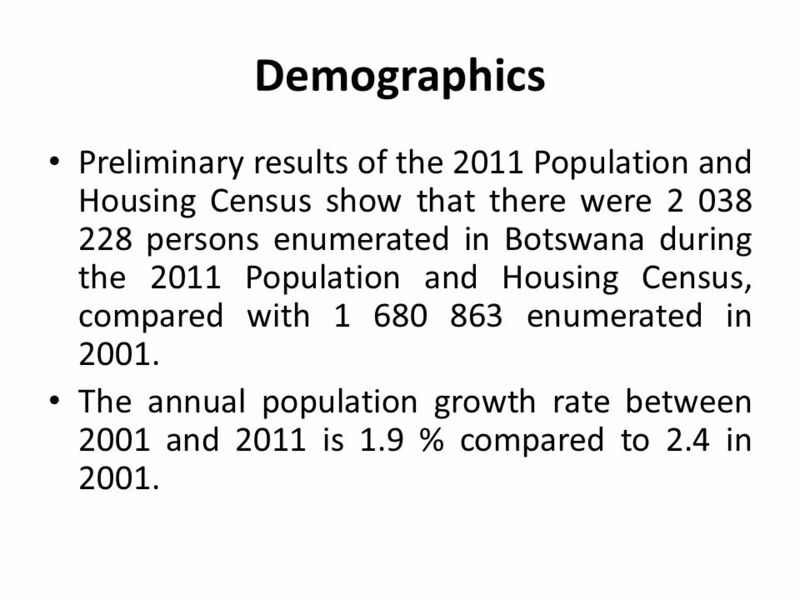 5 Demographics Preliminary results of the 2011 Population and Housing Census show that there were persons enumerated in Botswana during the 2011 Population and Housing Census, compared with enumerated in 2001. The annual population growth rate between 2001 and 2011 is 1.9 % compared to 2.4 in 2001. 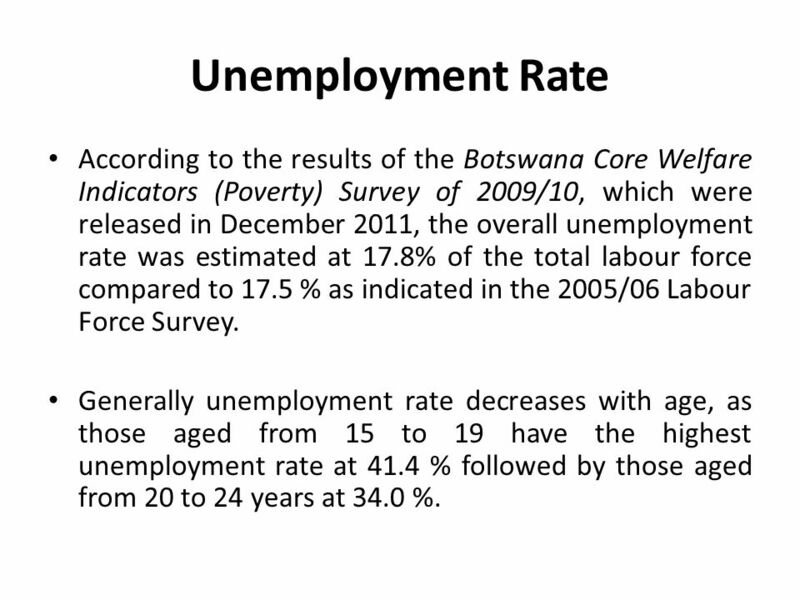 6 Unemployment Rate According to the results of the Botswana Core Welfare Indicators (Poverty) Survey of 2009/10, which were released in December 2011, the overall unemployment rate was estimated at 17.8% of the total labour force compared to 17.5 % as indicated in the 2005/06 Labour Force Survey. Generally unemployment rate decreases with age, as those aged from 15 to 19 have the highest unemployment rate at 41.4 % followed by those aged from 20 to 24 years at 34.0 %. 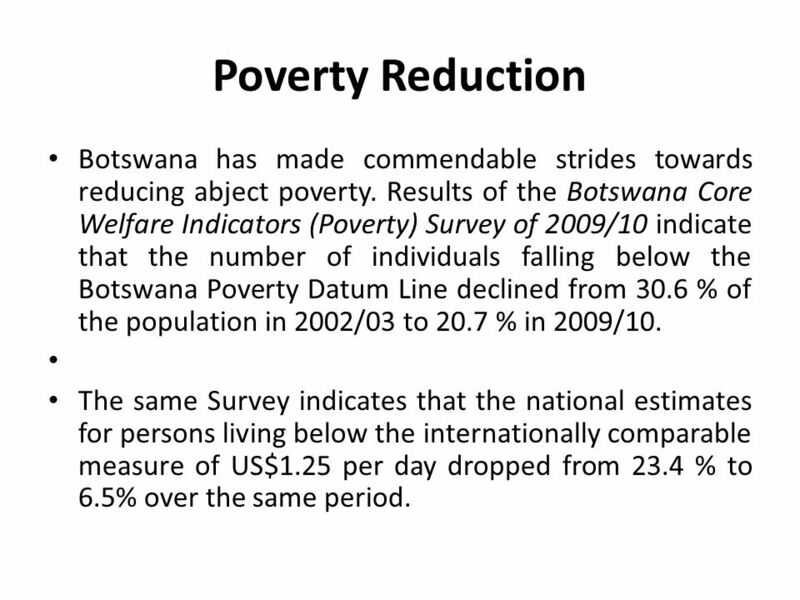 7 Poverty Reduction Botswana has made commendable strides towards reducing abject poverty. Results of the Botswana Core Welfare Indicators (Poverty) Survey of 2009/10 indicate that the number of individuals falling below the Botswana Poverty Datum Line declined from 30.6 % of the population in 2002/03 to 20.7 % in 2009/10. The same Survey indicates that the national estimates for persons living below the internationally comparable measure of US$1.25 per day dropped from 23.4 % to 6.5% over the same period. 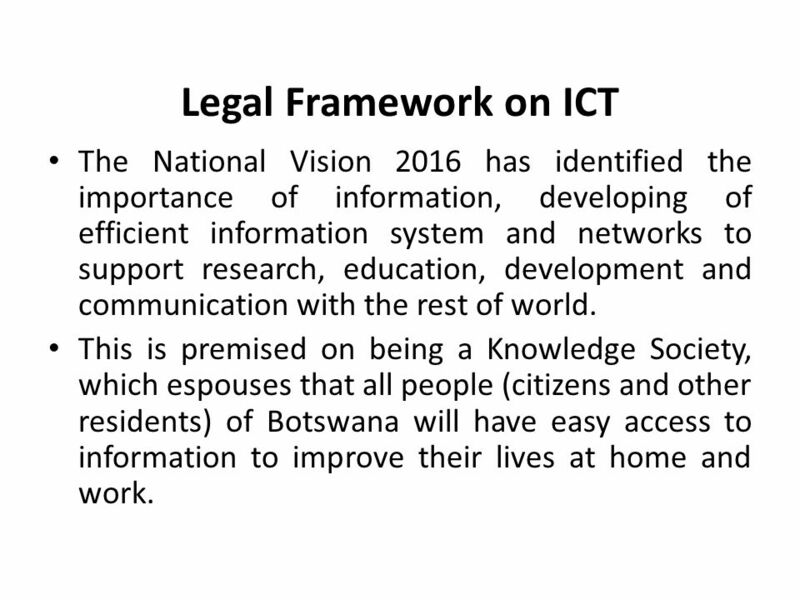 8 Legal Framework on ICT The National Vision 2016 has identified the importance of information, developing of efficient information system and networks to support research, education, development and communication with the rest of world. This is premised on being a Knowledge Society, which espouses that all people (citizens and other residents) of Botswana will have easy access to information to improve their lives at home and work. Information about all aspects of the economy, such as education, health, environment and business, will be available through the different information dissemination channels, which include telecommunication, electronic and print media. 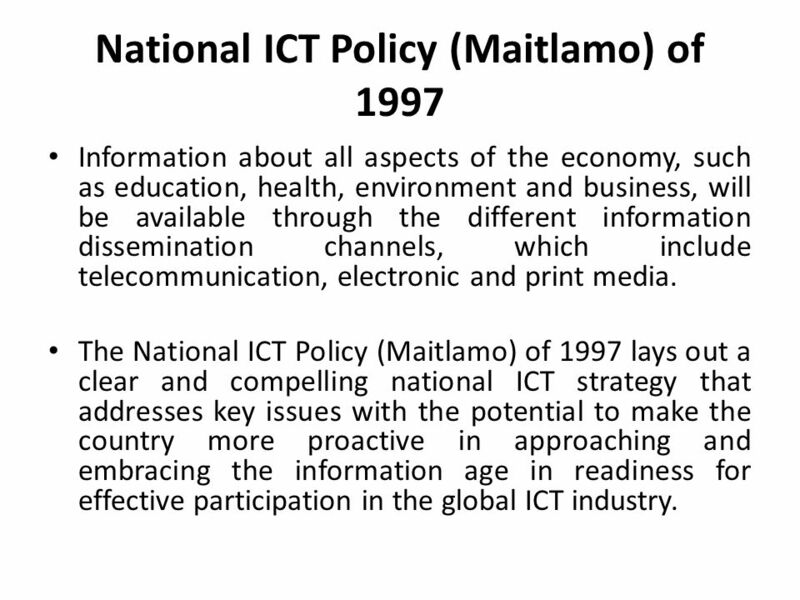 The National ICT Policy (Maitlamo) of 1997 lays out a clear and compelling national ICT strategy that addresses key issues with the potential to make the country more proactive in approaching and embracing the information age in readiness for effective participation in the global ICT industry. 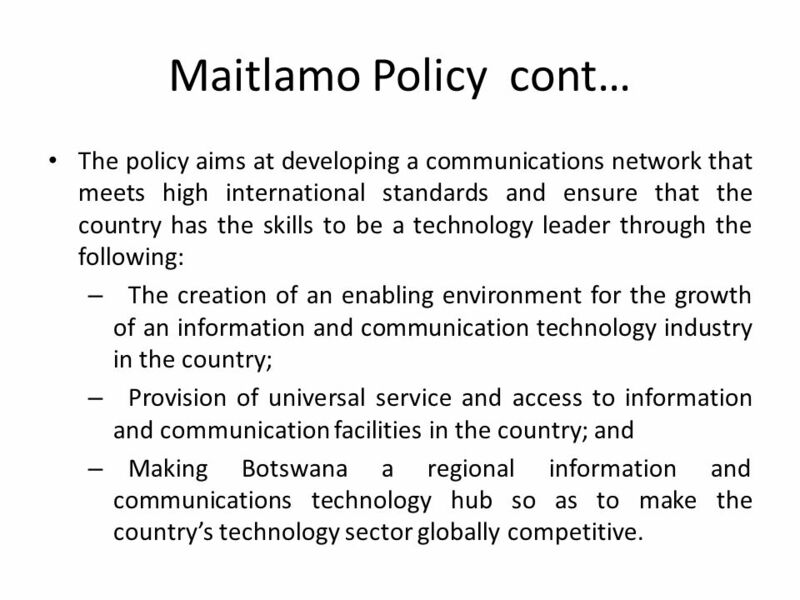 10 Maitlamo Policy cont… The policy aims at developing a communications network that meets high international standards and ensure that the country has the skills to be a technology leader through the following: The creation of an enabling environment for the growth of an information and communication technology industry in the country; Provision of universal service and access to information and communication facilities in the country; and Making Botswana a regional information and communications technology hub so as to make the country’s technology sector globally competitive. 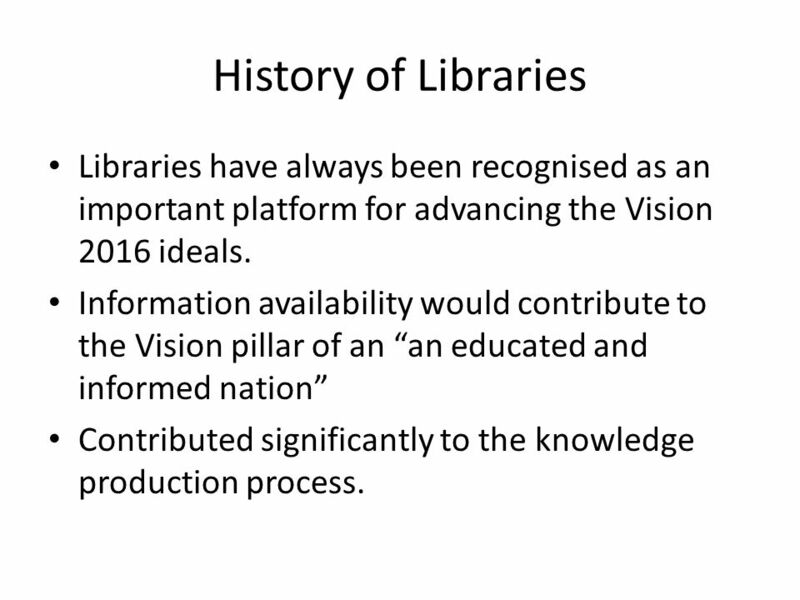 11 History of Libraries Libraries have always been recognised as an important platform for advancing the Vision 2016 ideals. Information availability would contribute to the Vision pillar of an “an educated and informed nation” Contributed significantly to the knowledge production process. 12 History cont.. 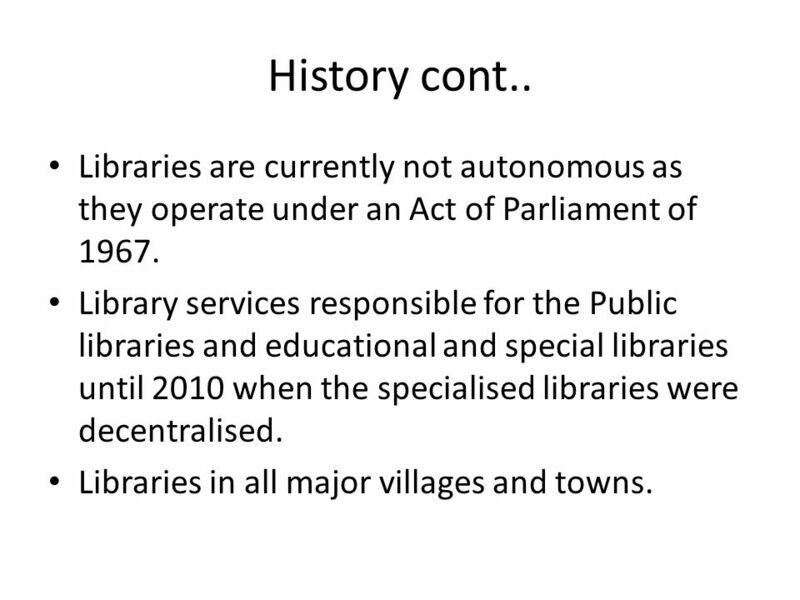 Libraries are currently not autonomous as they operate under an Act of Parliament of 1967. Library services responsible for the Public libraries and educational and special libraries until 2010 when the specialised libraries were decentralised. Libraries in all major villages and towns. 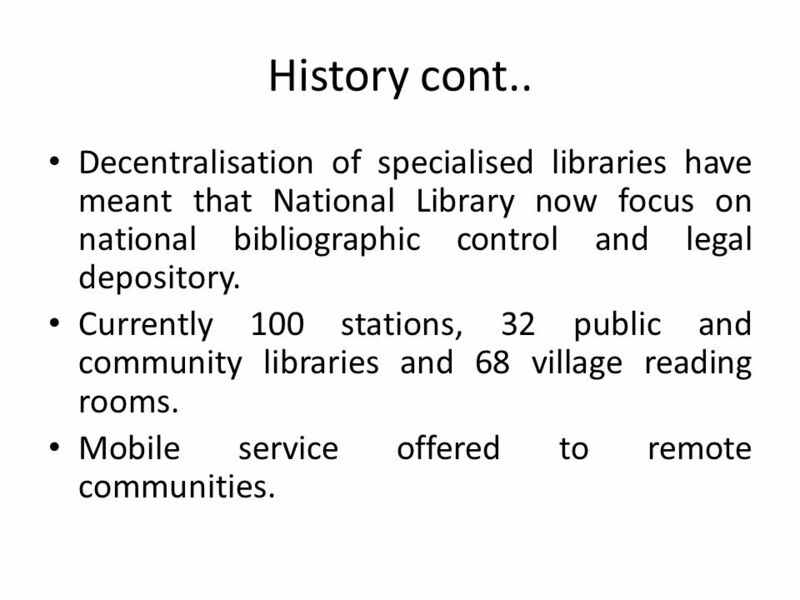 13 History cont.. Decentralisation of specialised libraries have meant that National Library now focus on national bibliographic control and legal depository. Currently 100 stations, 32 public and community libraries and 68 village reading rooms. Mobile service offered to remote communities. 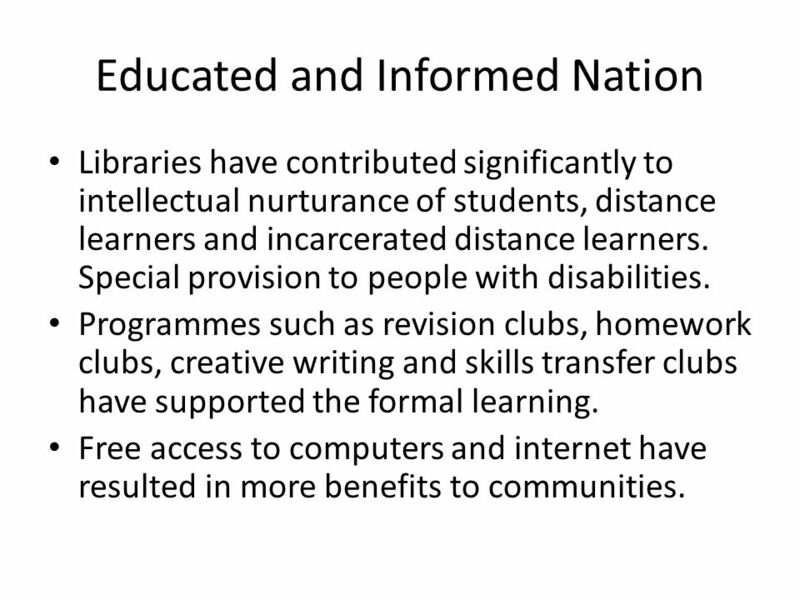 Libraries have contributed significantly to intellectual nurturance of students, distance learners and incarcerated distance learners. Special provision to people with disabilities. Programmes such as revision clubs, homework clubs, creative writing and skills transfer clubs have supported the formal learning. Free access to computers and internet have resulted in more benefits to communities. 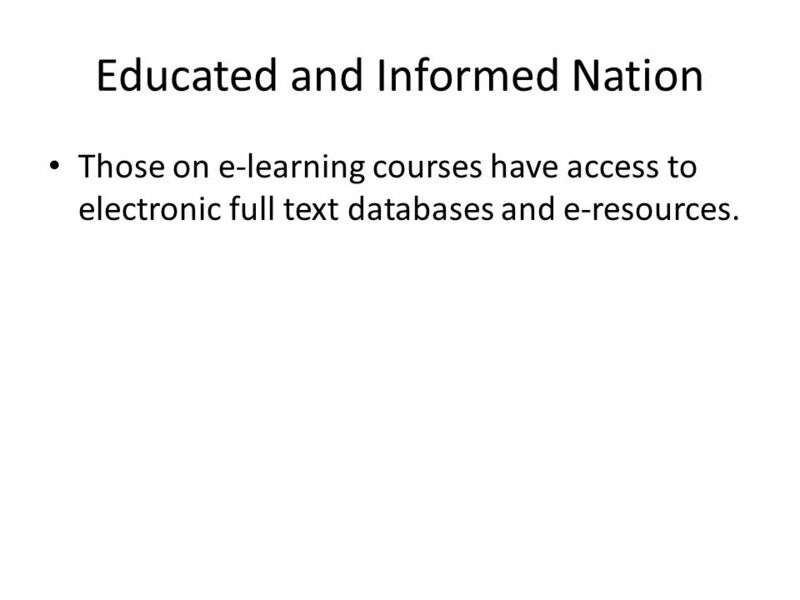 Those on e-learning courses have access to electronic full text databases and e-resources. 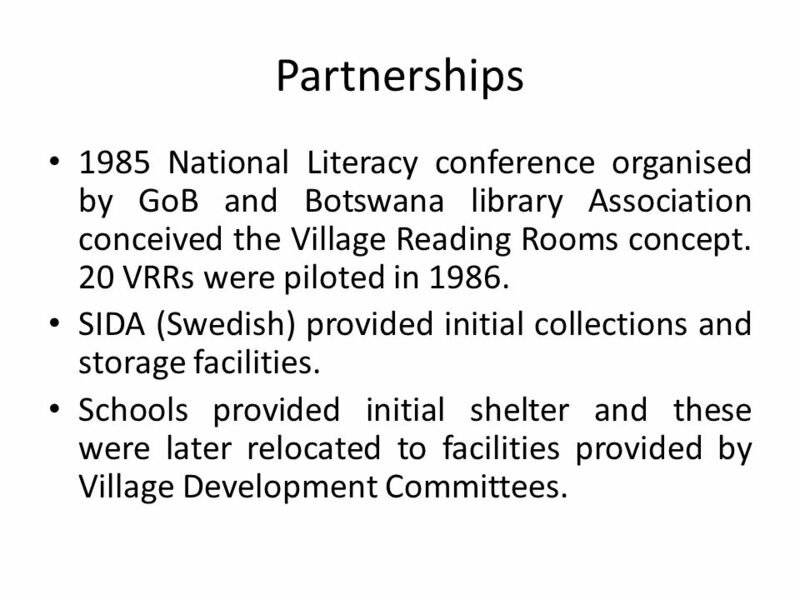 16 Partnerships 1985 National Literacy conference organised by GoB and Botswana library Association conceived the Village Reading Rooms concept. 20 VRRs were piloted in 1986. SIDA (Swedish) provided initial collections and storage facilities. Schools provided initial shelter and these were later relocated to facilities provided by Village Development Committees. 17 Partnerships 68 VRRs have since been built. Robert and Sara Family Foundation have added to the stock of libraries with 8 Community and cultural centres constructed. These have transformed service incredibly and increased access. As at 2009, there were 164 venues which provided access to information. 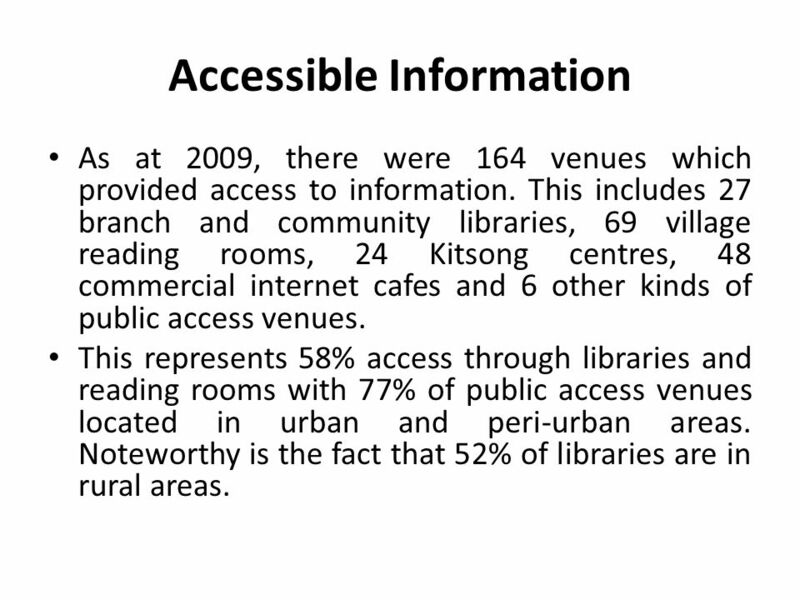 This includes 27 branch and community libraries, 69 village reading rooms, 24 Kitsong centres, 48 commercial internet cafes and 6 other kinds of public access venues. This represents 58% access through libraries and reading rooms with 77% of public access venues located in urban and peri-urban areas. Noteworthy is the fact that 52% of libraries are in rural areas. 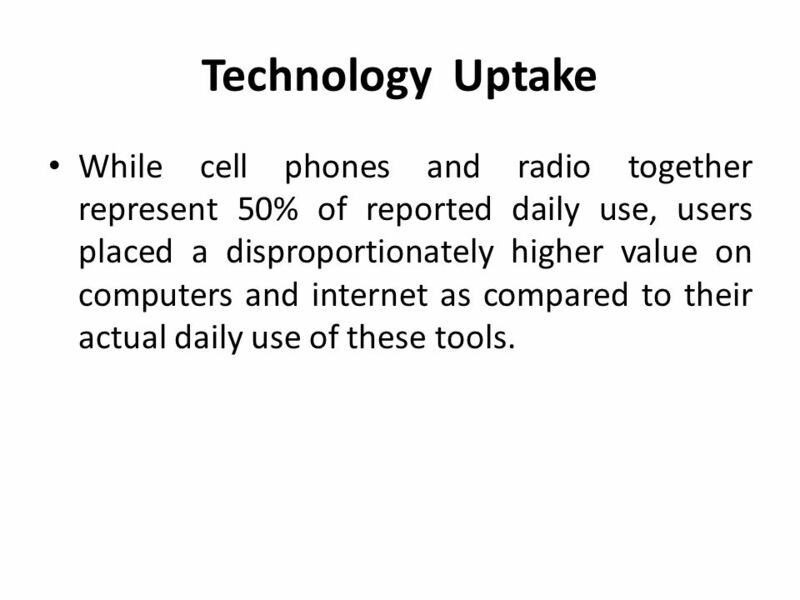 19 Technology Uptake While cell phones and radio together represent 50% of reported daily use, users placed a disproportionately higher value on computers and internet as compared to their actual daily use of these tools. 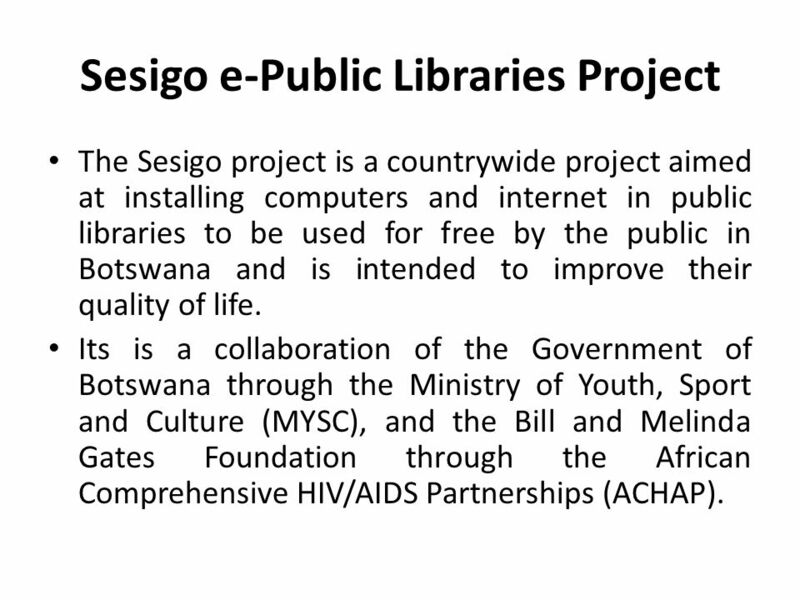 The Sesigo project is a countrywide project aimed at installing computers and internet in public libraries to be used for free by the public in Botswana and is intended to improve their quality of life. Its is a collaboration of the Government of Botswana through the Ministry of Youth, Sport and Culture (MYSC), and the Bill and Melinda Gates Foundation through the African Comprehensive HIV/AIDS Partnerships (ACHAP). 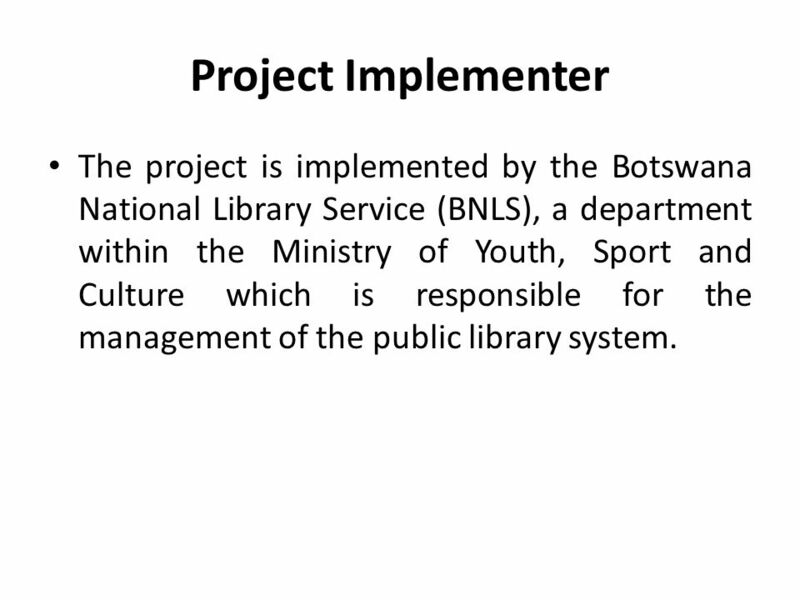 21 Project Implementer The project is implemented by the Botswana National Library Service (BNLS), a department within the Ministry of Youth, Sport and Culture which is responsible for the management of the public library system. 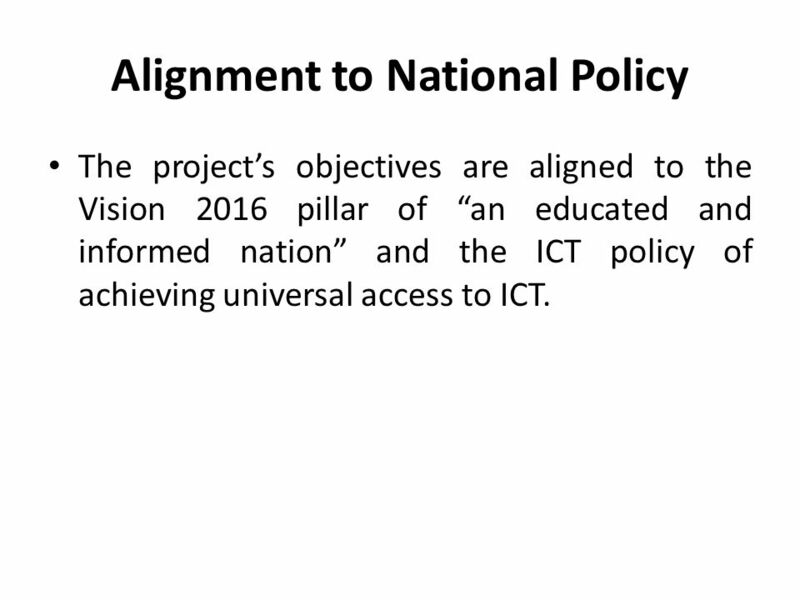 The project’s objectives are aligned to the Vision 2016 pillar of “an educated and informed nation” and the ICT policy of achieving universal access to ICT. 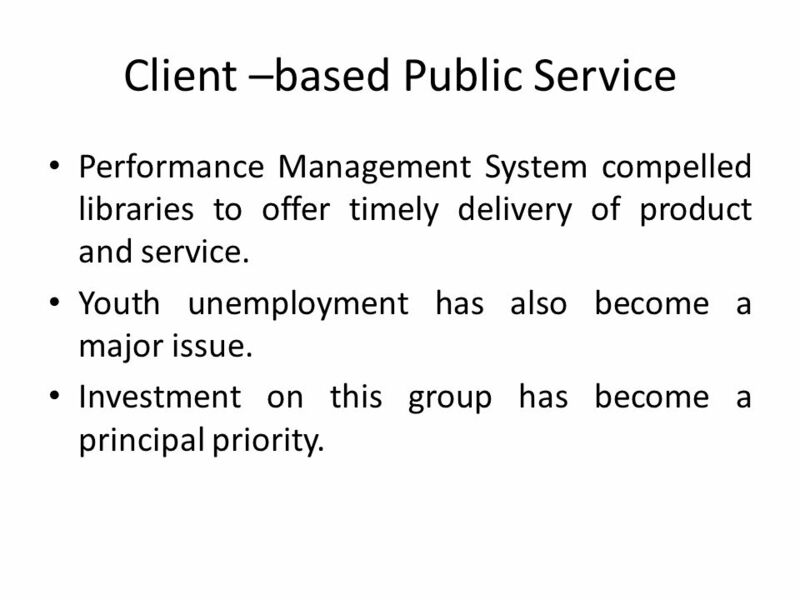 Performance Management System compelled libraries to offer timely delivery of product and service. Youth unemployment has also become a major issue. Investment on this group has become a principal priority. 24 Client Based Public Service cont.. Need to empower future leaders to become responsible citizens who will transform Botswana into a more economically stable and self sustaining country. 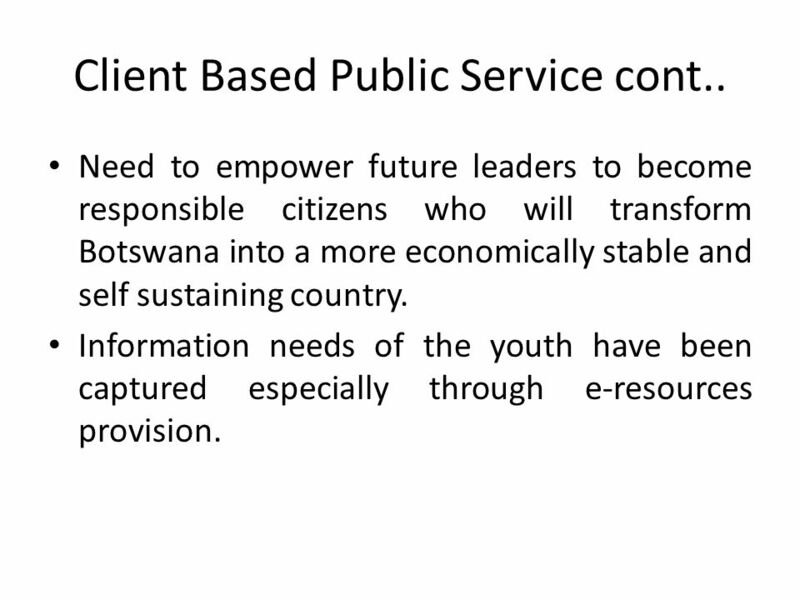 Information needs of the youth have been captured especially through e-resources provision. 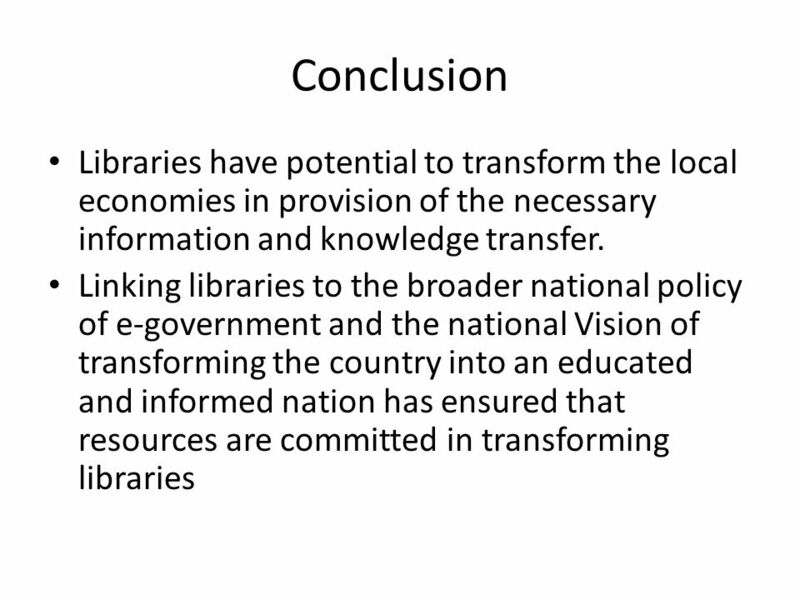 To enable public access computers and internet services in public libraries and ensure they are used by Batswana. To empower library staff to be effective library champions and information workers in the communities they serve. To build partnerships that strengthen the library system and information society programming in libraries. To position libraries as strong cultural partners for preservation of Botswana’s cultural heritage. 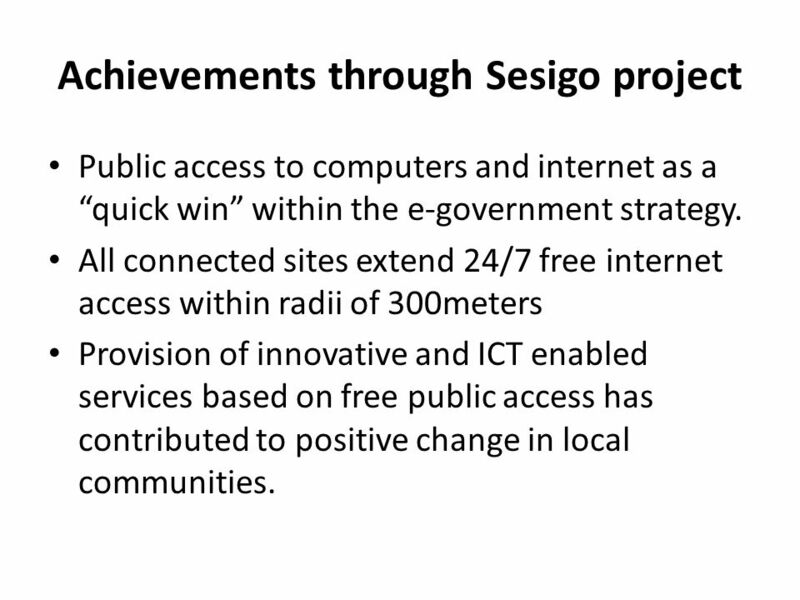 Public access to computers and internet as a “quick win” within the e-government strategy. All connected sites extend 24/7 free internet access within radii of 300meters Provision of innovative and ICT enabled services based on free public access has contributed to positive change in local communities. 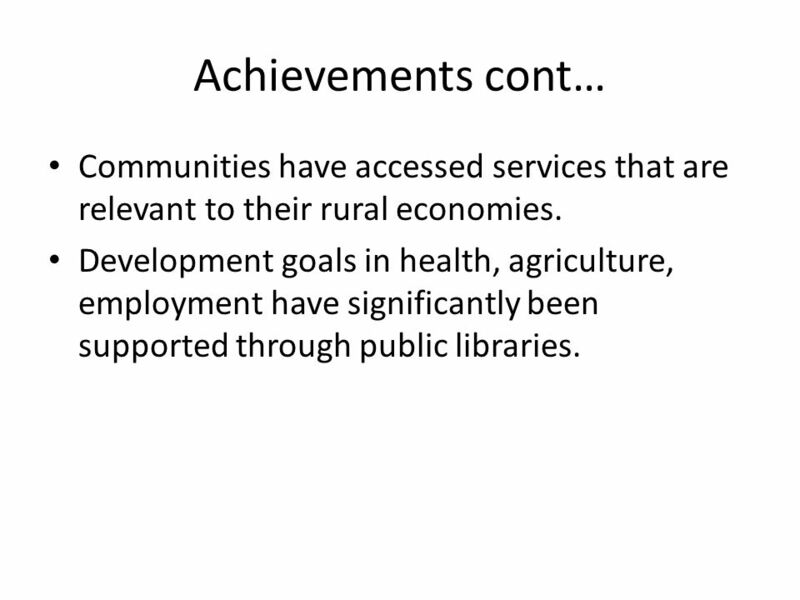 29 Achievements cont… Communities have accessed services that are relevant to their rural economies. 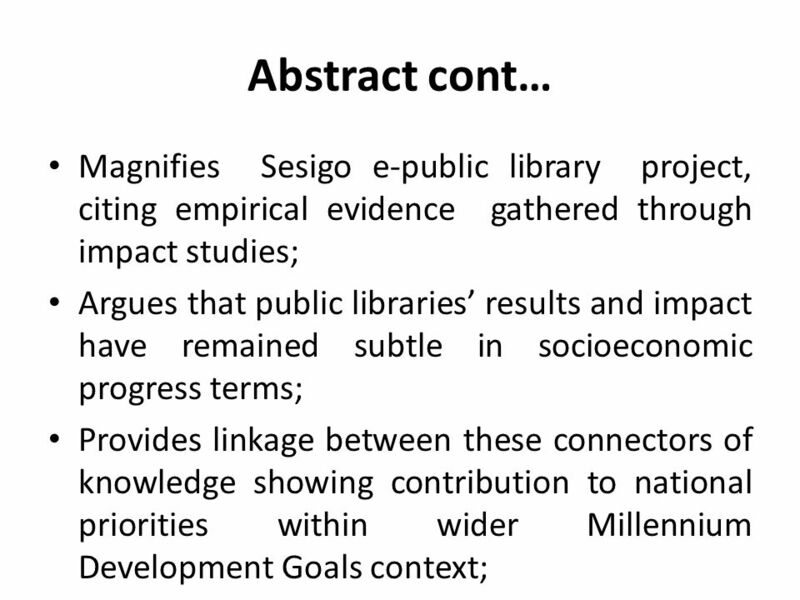 Development goals in health, agriculture, employment have significantly been supported through public libraries. 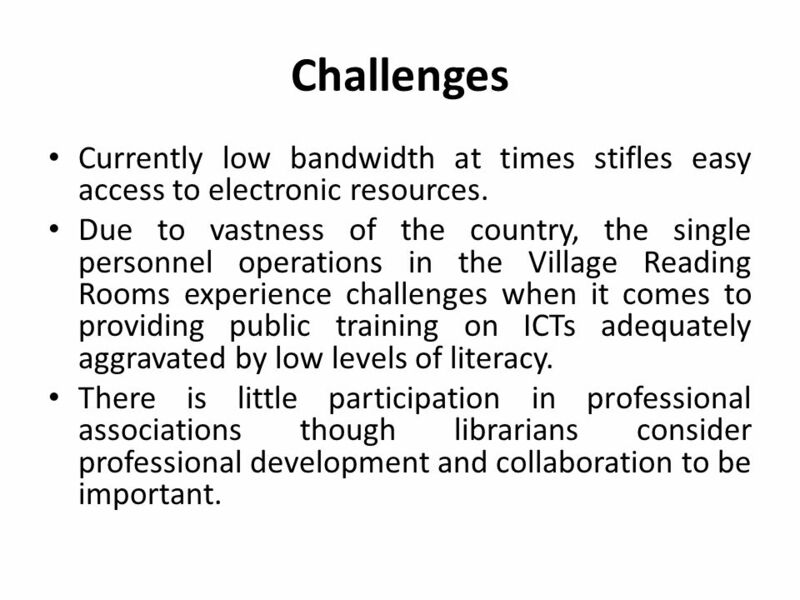 30 Challenges Currently low bandwidth at times stifles easy access to electronic resources. Due to vastness of the country, the single personnel operations in the Village Reading Rooms experience challenges when it comes to providing public training on ICTs adequately aggravated by low levels of literacy. There is little participation in professional associations though librarians consider professional development and collaboration to be important. 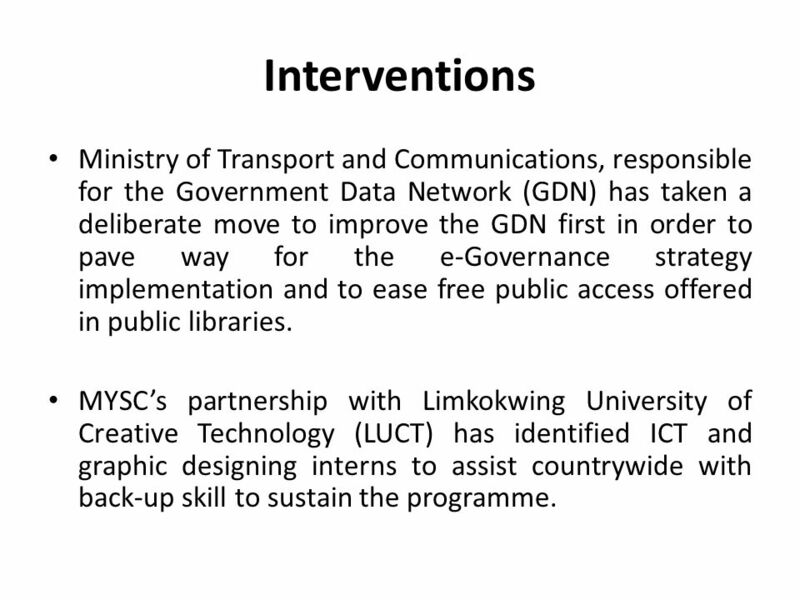 31 Interventions Ministry of Transport and Communications, responsible for the Government Data Network (GDN) has taken a deliberate move to improve the GDN first in order to pave way for the e-Governance strategy implementation and to ease free public access offered in public libraries. MYSC’s partnership with Limkokwing University of Creative Technology (LUCT) has identified ICT and graphic designing interns to assist countrywide with back-up skill to sustain the programme. 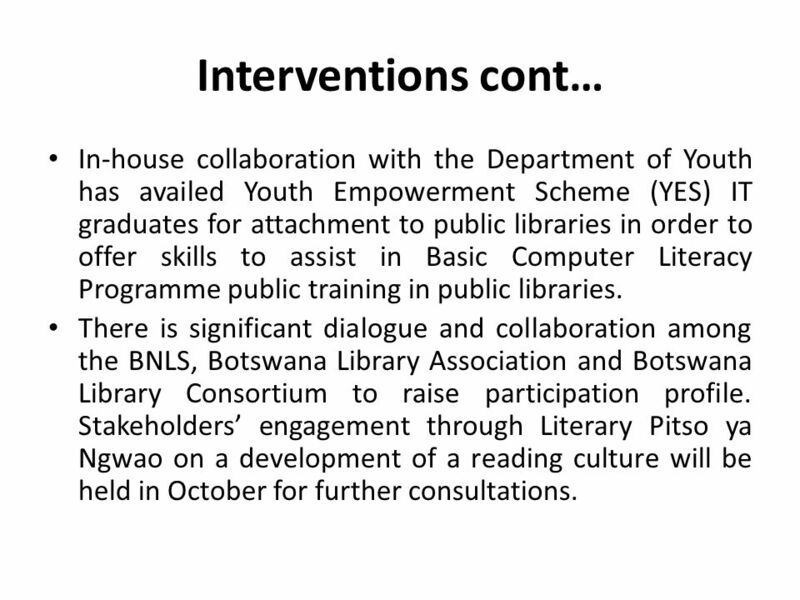 32 Interventions cont… In-house collaboration with the Department of Youth has availed Youth Empowerment Scheme (YES) IT graduates for attachment to public libraries in order to offer skills to assist in Basic Computer Literacy Programme public training in public libraries. 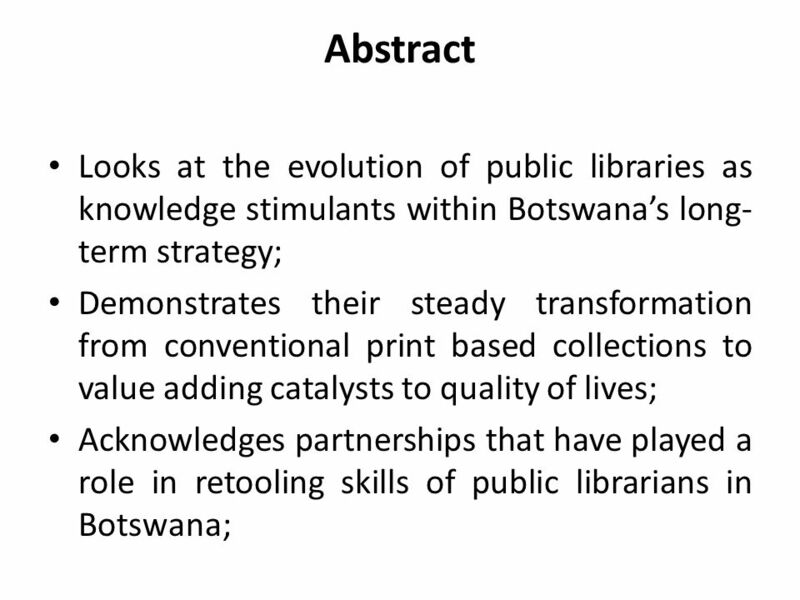 There is significant dialogue and collaboration among the BNLS, Botswana Library Association and Botswana Library Consortium to raise participation profile. Stakeholders’ engagement through Literary Pitso ya Ngwao on a development of a reading culture will be held in October for further consultations. 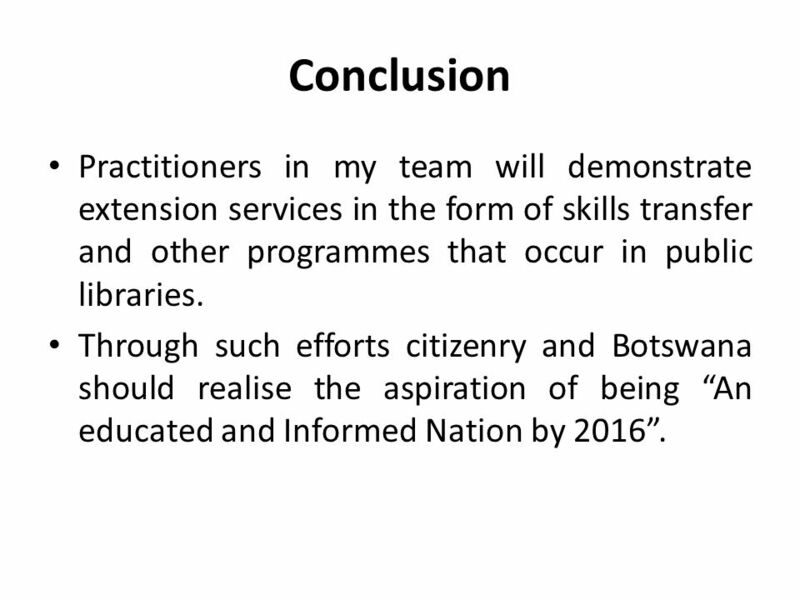 34 Conclusion Practitioners in my team will demonstrate extension services in the form of skills transfer and other programmes that occur in public libraries. Through such efforts citizenry and Botswana should realise the aspiration of being “An educated and Informed Nation by 2016”. 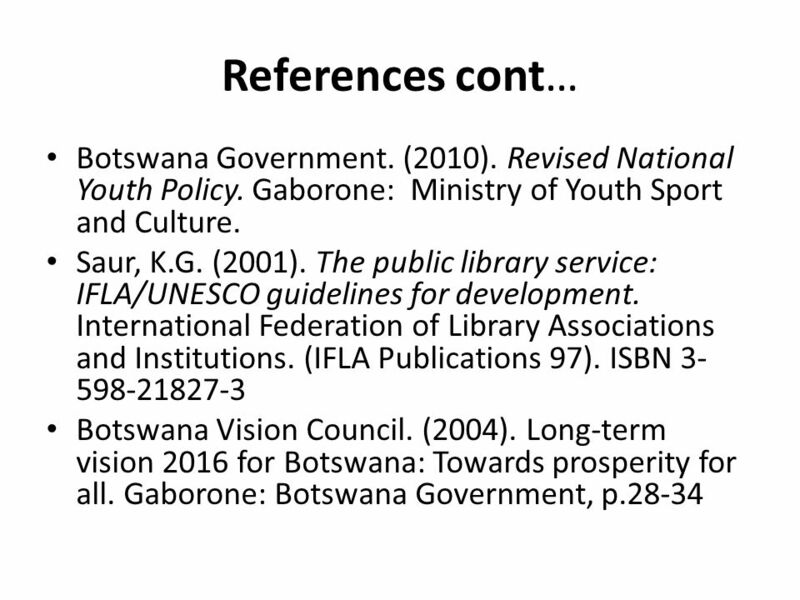 35 References Botswana Government.(2004). Maitlamo ICT Policy. Ministry of Infrastructure, Science and Technology. Botswana Government. (2006). 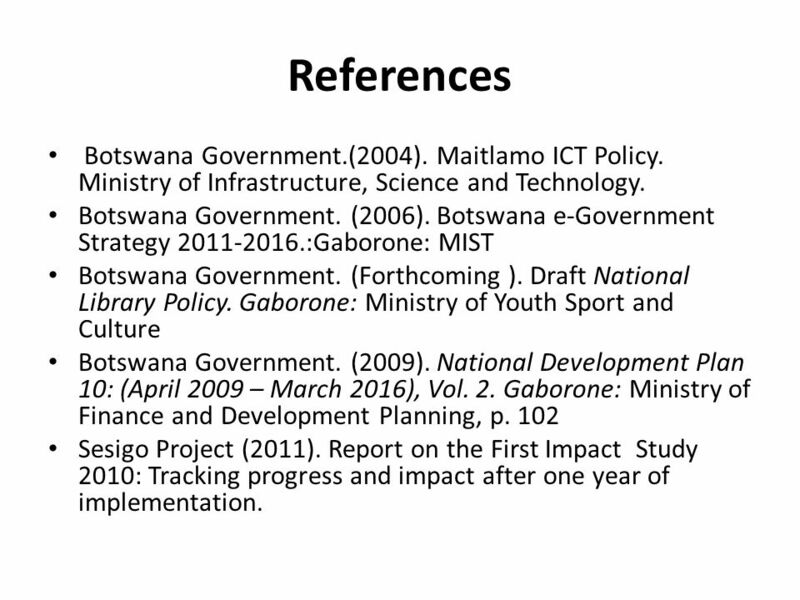 Botswana e-Government Strategy :Gaborone: MIST Botswana Government. (Forthcoming ). Draft National Library Policy. Gaborone: Ministry of Youth Sport and Culture Botswana Government. (2009). National Development Plan 10: (April 2009 – March 2016), Vol. 2. 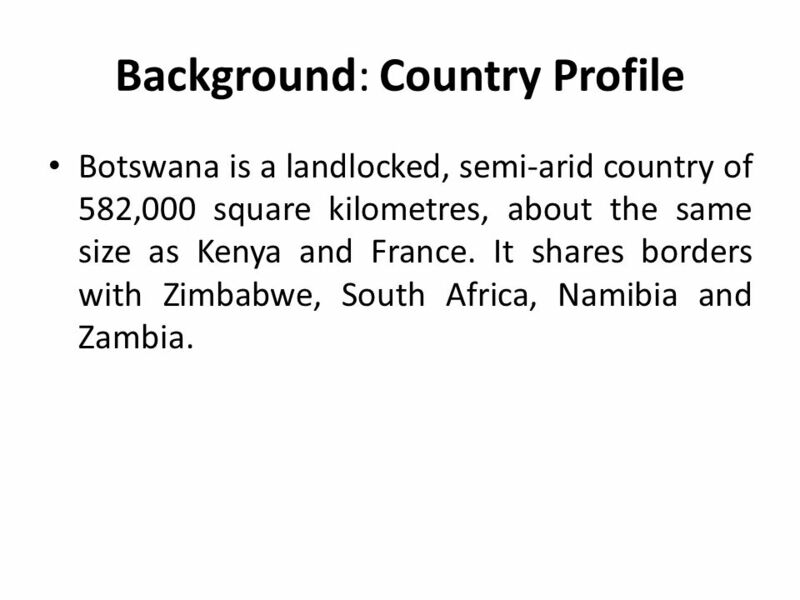 Gaborone: Ministry of Finance and Development Planning, p. 102 Sesigo Project (2011). Report on the First Impact Study 2010: Tracking progress and impact after one year of implementation. 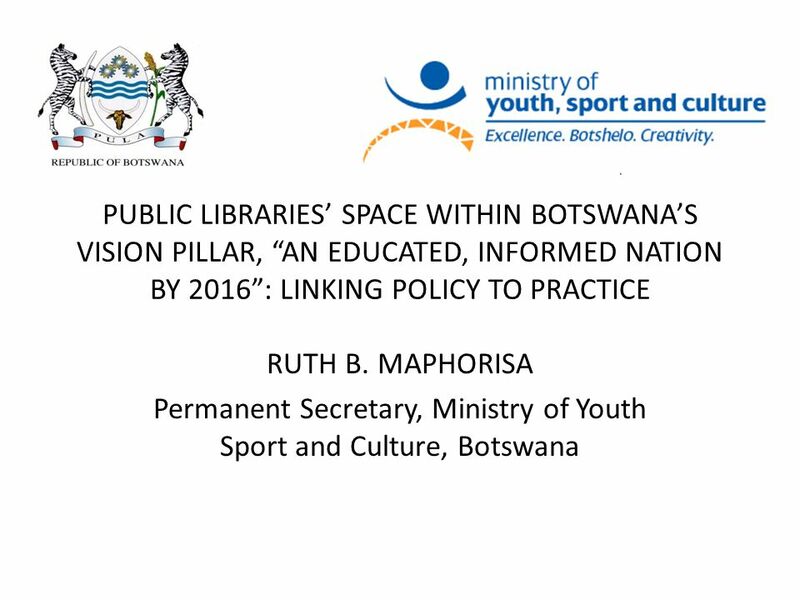 Download ppt "Permanent Secretary, Ministry of Youth Sport and Culture, Botswana"
United Nations Decade of Education for Sustainable Development. European Universities Charter on Lifelong learning Bologna employability seminar Luxembourg, November Howard Davies, senior adviser, EUA. International Telecommunication Union National Reporting on WSIS Implementation Mechanisms and ICT Strategies Jaroslaw K. Ponder International Telecommunication. Dissemination and Use of Copyrighted Works for Education and Research Mohammed El Said (UCLAN) Arab-African Seminar on Exceptions and Limitations Cairo. Older Peoples Consultative Group 24 th March 2010 Developing a New Older Peoples Strategy. SOUTH AFRICA’S PARTICIPATION AT THE 6 TH SESSION OF THE WORLD URBAN FORUM Presentation to the Human Settlements Portfolio Committee 15 August 2012.